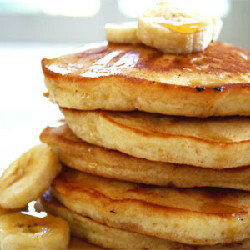 Oatmeal, bananas and pancakes for breakfast, all at once! You will be surprised by the sweetness and heartiness of this recipe, better yet, Ill keep you going all morning. Mix the eggs with the vanilla, brown sugar and oats. Mash the bananas and add to egg mixture. Add cinnamon, baking powder and mix together well. In a warm skillet, add the grape seed oil and spoon about 1/4 cup of the mix for a larger pancake. Cook on one side until the pancake is done then flip and finish cooking. *You can always add a tablespoon of dark chocolate chips, dried fruits or nuts to your pancakes.